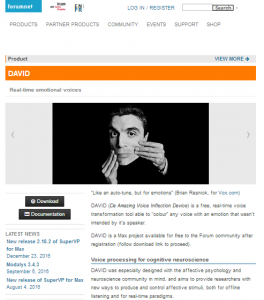 Voice transformation tool DAVID now available on the IRCAM Forum! Exciting news! As of March 2017, DAVID, our emotional voice transformation tool, is available as a free download on the IRCAM Forum, the online community of all science and art users of audio software developped in IRCAM. This new plateform will provide updates on the latest releases of the software, and better user support. In addition, we’ll demonstrate the software at the IRCAM Forum days in Paris on March 15-17, 2017. Come say hi! (and sound all very realistically happy/sad/afraid) if you’re around. UPDATE: D.A.V.I.D. was named after Talking Heads frontman David Byrne, certainly, but we’re still more than a little bit excited that another of our great idols, Brian Eno, should ‘like’ our release announcement on twitter! Yeah, thanks Brian! DAVID (Da Amazing Voice Inflection Device) is a free, real-time voice transformation tool able to “colour” any voice recording with an emotion that wasn’t intended by it’s speaker. DAVID was especially designed with the affective psychology and neuroscience community in mind, and aims to provide researchers with new ways to produce and control affective stimuli, both for offline listening and for real-time paradigms. For instance, we have used it to create real-time emotional vocal feedback here. 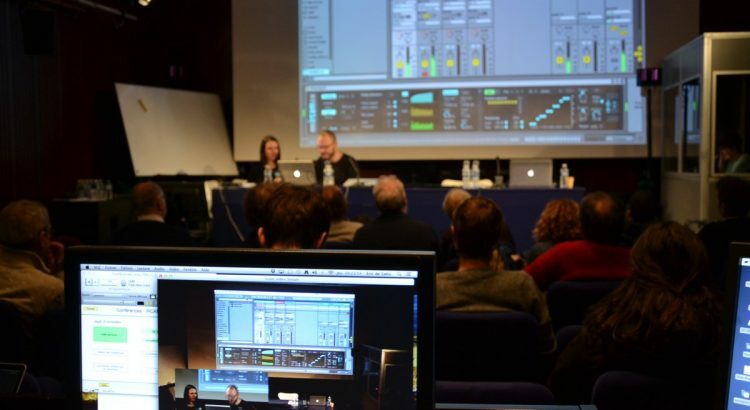 Connect to the IRCAM Forum here, create a (free) user account, and try the tool for yourself!